As a core subject English is seen as an integral part of the College curriculum. In the pursuit of academic excellence the department values the allocation of five periods per week at junior level and six for students studying for their Leaving Certificate to this subject. As a result there is a very high uptake at Honours level (at present 98% at Junior Certificate and 100% at Leaving Certificate). Our aim, as a department, is to enable our students to become confident, articulate independent thinkers. As we move further into the 21st century it is our desire to embrace the many new teaching methodologies promoted by inspirational educationalists such as Paul Ginnis and CK Jackson. In particular, active discussion is an essential element of the English classroom leading to positive peer teaching and learning. As we very conscious of the variant stages of intellectual development of students we provide mixed ability groupings (usually in line with the basic class assignation) until the beginning of Fifth Year. Students are then streamed after consideration of their Junior Certificate results and their performance in Transition Year. Art — explores the narrative contained within a canvas, the use of symbolism, the link between image and words in calligraphy. Religion — aids in the development of critical and independent thinking often concerning emotive or controversial issues. Economics- forms the ability to understand the economic challenges facing the world. Business Studies- fosters the ability to present facts clinically using the language of information. CSPE — increases knowledge of how government works, how society is made up, emphasising their role as citizens of the world. Music- highlights the emotive narrative in a piece of music, the poetic quality of lyrics, creation of mood and atmosphere. 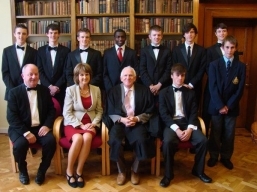 All students are encouraged to participate in the debating societies in the College. Meetings take place during lunch times and after school. We are very proud of the high level of participation in debating competitions as these students confidently grow in their ability to engage in verbal combat! In relation to other extracurricular activities, participation in the annual College drama or musical is hugely encouraged. Provide students with the skills necessary to communicate (speaking and listening) in an effective and coherent manner. Promote excellence in standards of literacy. Encourage personal and individual response to literature. Develop knowledge, understanding and appreciation of poetry. Create an environment that fosters creativity. Develop an enthusiasm for drama. Foster a love of the world of fiction. Develop an awareness and understanding of the power of the media in the world today. Encourage students to communicate their ideas with confidence. Develop positive attitudes such as empathy as well as an appreciation for different perspectives on issues of controversy and contention.